In a word: Lavender blue. 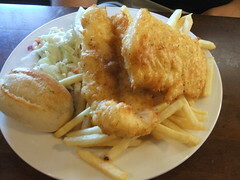 JM ate the 2pc fried cod with a lemonade. Nichole ate the fried perch with a Sprite Zero. The bill was $44, or $22/person (the curds were comped), plus tip. 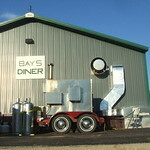 JM gave Bay 5 Diner a B+; Nichole gave Bay 5 Diner an A- (see our grading rubric). Bay 5 seems to be named after the nook in a former garage where it fits, next to some other small businesses, in Mazomanie. It's spotless inside, with fresh paint, wooden chairs & tables (with a ding or two here or there) set precisely with condiments on a napkin in the center. The place probably seats 50 including a few stools at the counter and some folks can enjoy an evening out front when the weather permits. They've also got a big meat smoker outside and pride themselves on their BBQ, served Wednesdays and Saturdays. Thursday was advertised as pasta night; Sunday there's breakfast, and Friday there's a fish fry which was our lot. It's definitely a family operation, possibly several generations. It kind of felt like we were in their kitchen as elders sat in folding chairs outside and kids ran dishes back and forth. The seating was a bit awkward (with no host) and our table by the door would NOT be pleasant in winter, what with the door letting in gusts of outdoor air at every entrance. So, the service was sweet but a little spacy, resulting in comped cheese curds. Such curds! We'd never seen such curds! They must have averaged 2 ounces of fresh orange Sassy Cow cheese and super light batter. Like the kind at the MN state fair, but better because they were in Dane County. The ideal consumption window was 30 seconds to 3 minutes while the curds were stretchy and perfect. Dinner was very dilly. 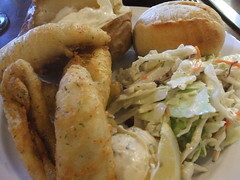 On both the cod and the perch, there was dill in the batter. Said batter was light and - dilly. On the cod, it gave way to substantial pieces of mild, flaky fish. On the perch, it was unaccountably salty. There was also dill in the tartar, and dill in the slaw. Said slaw was amazingly fresh, with big pieces of crunchy green cabbage and shredded red cabbage and carrots. While the rolls were fresh baked, they'd probably come direct from a supplier. The potato items were average. Cheesecake was available for dessert, but we passed. Frankly, we thought dinner was a bit expensive, even with the generously comped curds (an $8 value). The perch at $22 is probably to blame (it's on par with $20 for a three-piece cod meal). Calls to Mazo are pretty rare for us. But if we were in town for a breakfast or (please, please) a BBQ night, we'd certainly consider stopping again. I spend most weekends in Mazo. We ate there a few months ago. The pizza was OK but unremarkable. The prime rib was too fatty for Todd. I don't think it's his favorite cut of meat, but his family highly recommended it. 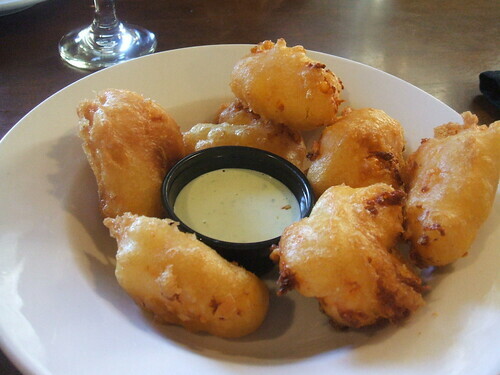 I wish I had gotten the cheese curds; those look delicious. When we were there, there was a kid playing a really bloody video game on the big TV. We were with a child too young to witness those kinds of games. It was very awkward to try to keep the young one from looking at the TV.